We finally made it. My favorite time of the year. WELCOME TO THE BEGINNING OF HALLOWEEN CRAFTING. I know what you are thinking…”Trisha, um, it’s August.” Yes, I know, but I can assure you that getting started on Halloween crafting will take you from the heat of the left over summer to feeling in the fall mood in a hot minute. And if it doesn’t, at least I’m starting to give you some ideas NOW so when you get around to shopping, you will know what you want. Let’s just say I am taking one for the team- and happily. One last piece of business- this fall I will be trying something different and sharing a ton more videos on how to create these crafts with you. I have ordered a really cool phone holder so I can easily craft while you watch and play along. 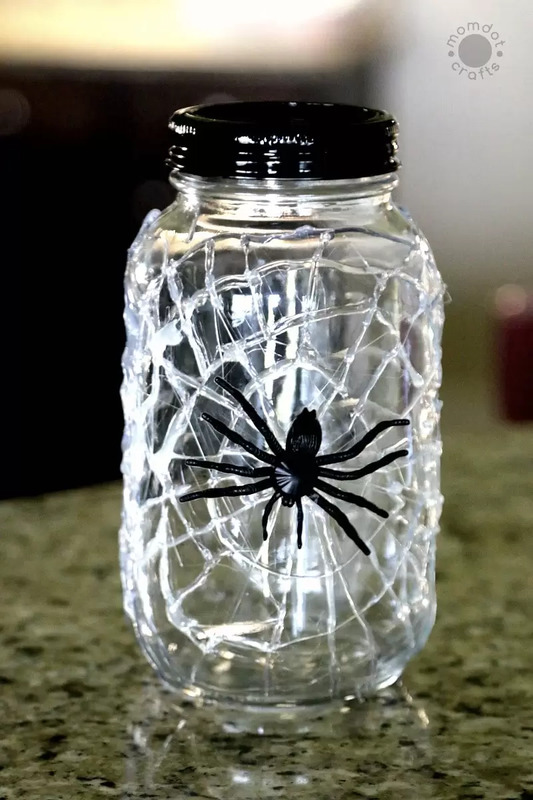 While it’s not here yet and won’t make a difference for this particular Halloween Mason Jar craft, I hope to back track and do this one live for you. One of the things I love about crafting for Halloween is how SIMPLE it is. Throw some black on it and it’s done, am I right? 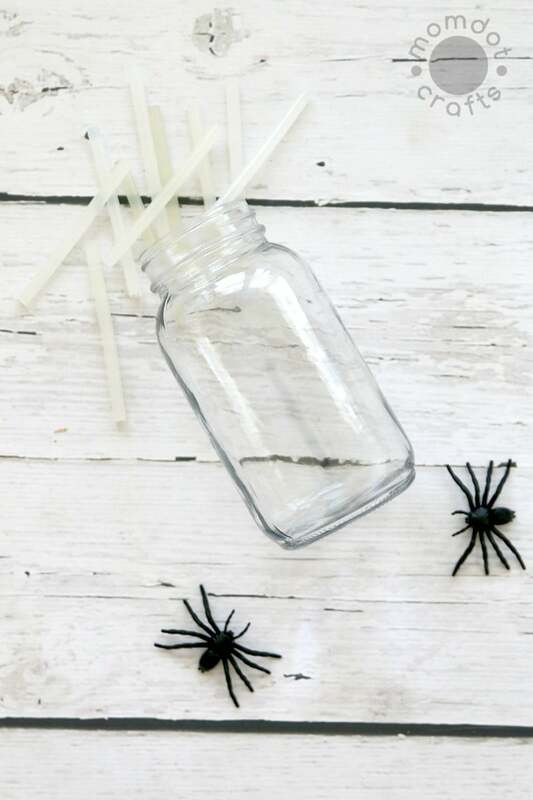 This mason jar craft is right up there; minimal supplies and minimal time, with totally fun results. 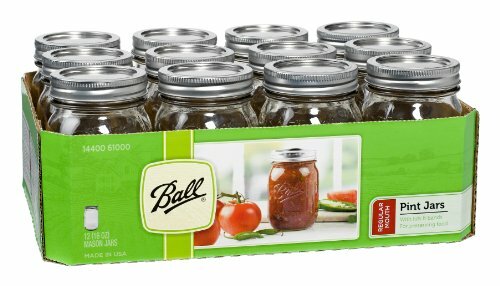 DO NOT FORGET TO GET A PACK OF MASON JARS! When I created this craft I did it super basic. 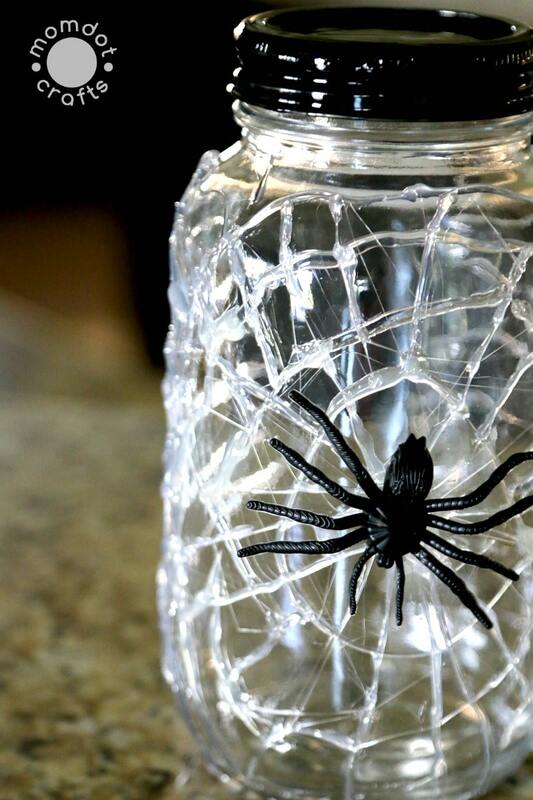 Plain jar, plain glue, and a black spider. I love the results which look classic and clear in my home. 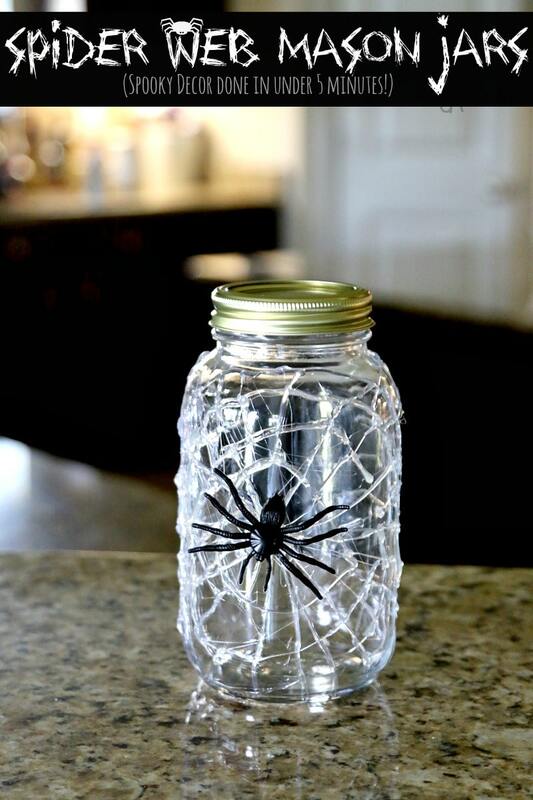 You could really get wild with this by using silver or black hot glue or prepainting your mason jar another color like black or red. 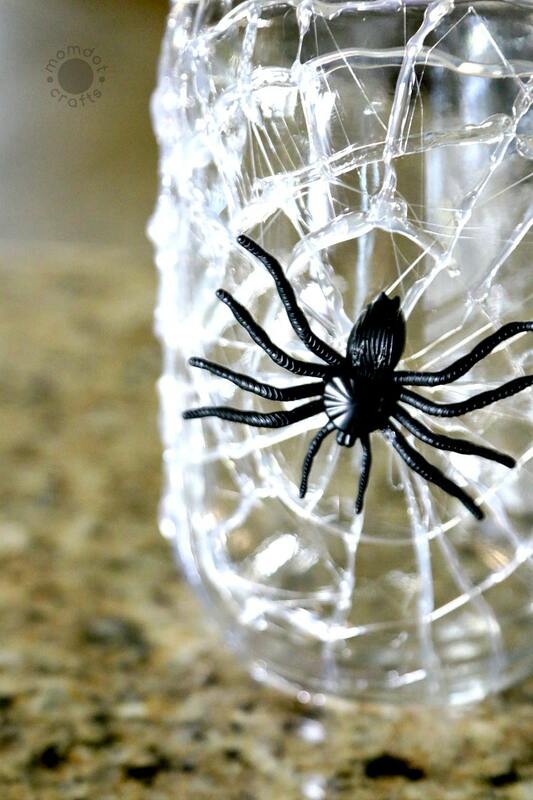 Additionally, you would easily add a glow stick in this at night to light up the web and spider! The possibilities are endless, so consider this a BASIC CRAFT to get started. 1) Start with making a tiny circle which will be the center of your web. Continue making circles with your hot glue all around the jar. Then easily start connecting lines. You don’t have to take too much care with the glue to be perfect (unless you want) as the weird strings from the glue make it a lot more spooky. Once you have your web to your liking, put your spider on your web and done! 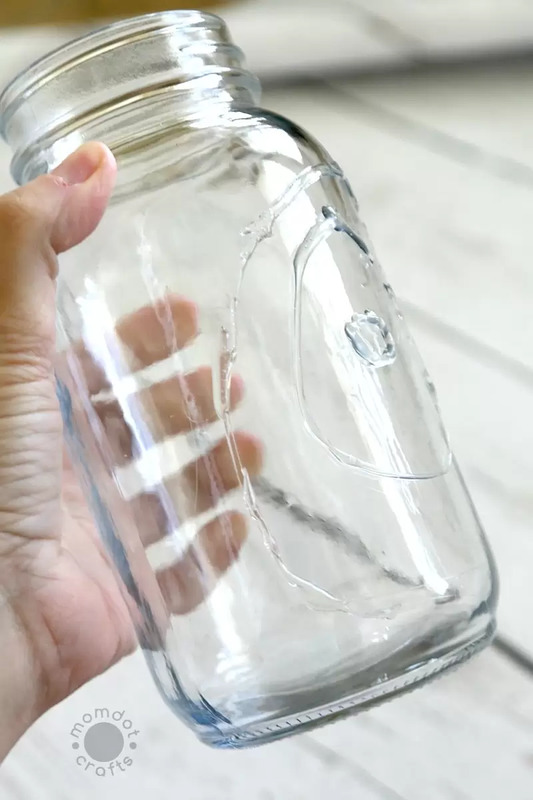 2) The great thing about this easy mason jar craft is that hot glue peels OFF. If you hate your design, start over! 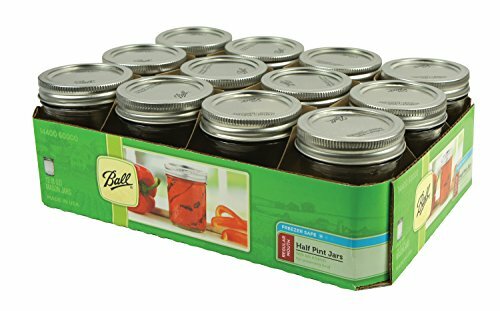 After Halloween, simply peel off and use the jar for a Christmas Craft. Woot! Love this? Share it! When you share these crafts it helps not only others find them, but helps me continue to make more amazing things for you to try out in your own home! Thank you for your support and love this fall.